I have so many exciting things coming in 2017 and one of those things is a Twitter Chat! This chat will be about parties of course! Topics will include general party information, birthday parties for adults, all the large holidays and even the unique ones like cheese cake day. I'm hoping to bring you guest party bloggers to weigh in on topics and bring in some brands too! I really enjoy participating in Twitter chats. They're fast paced, fun, full of information and you meet lots of great people. Which is why I decided to start one. Have you participated in a Twitter chat? If you have let me know which one(s). Can't make it Tuesday's when the chat takes place? 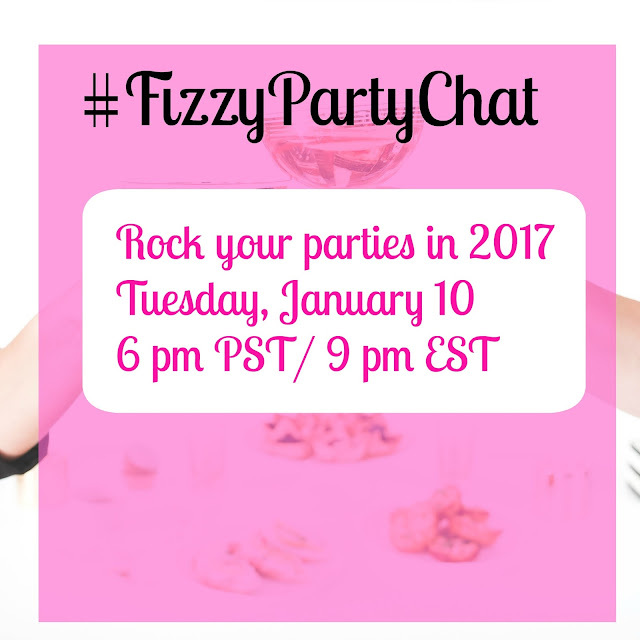 That's ok, just search #FizzyPartyChat on Twitter and join the party when you can. Look forward to talking parties with you !